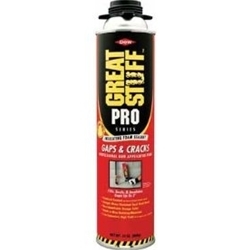 GREAT STUFF PRO™ Gaps & Cracks Insulating Foam Sealant is a minimal-expanding, single component polyurethane foam sealant for general purpose building envelope air sealing. As the first foam sealant to be recognized as a fireblock, GREAT STUFF PRO™ Gaps & Cracks resists the free passage of flames to other areas of the building through concealed spaces. Identifiable orange color. *Simplify foam application with PRO Series foam dispensing guns (PRO 13, PRO 14 and PRO 15). Use GREAT STUFF PRO™ Gun Cleaner to simplify cleanup of uncured polyurethane foam from dispensing guns and work areas.